me He does not need to break. with one such as me? i am lost in unworthiness. and my heart sings back. to an eternity of wounds. On this Feast of St. Thérèse of the Child Jesus, please pray for me, dear friends, that I may follow her on the path to holy surrender. 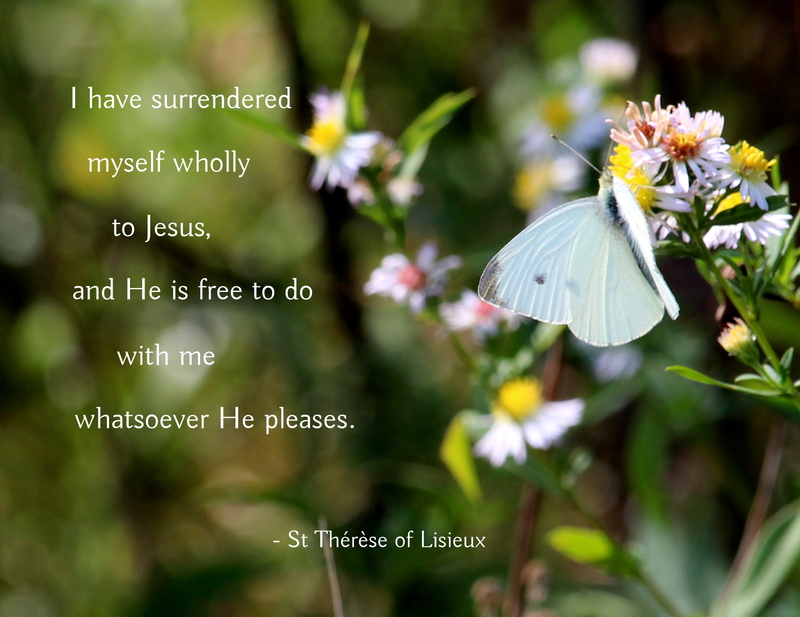 This entry was posted in poetry and tagged consecration, st. therese of lisieux on October 1, 2017 by mary. Beautiful, Mary. Thank you. I will keep you in my prayers. Thanks, MT. You and yours in my prayers as well. Sometimes I find poems that are like prayers, and very often (very often) prayer from the heart turns out to be poetry. Then there is that simpler poem-prayer, “Thank you,” which can also be just a friendly thank you to one other as we share our lives. So thank you, Mary, for this special gift. I had to pause here: “me He does not need to break. / i am already broken.” Later I went back to copy those lines. Now the whole poem will encourage me me when I think i shouldnt join the communion line. and nothing is evil except sin. said Dame Julian of Norwich. Thanks, Al, for both comments. A “found poem”, indeed in St. Julian of Norwich.Thank you for finding and sharing. The white space of the poetic line sometimes helps me read more slowly what I need to carefully digest.